Steelers safety Sean Davis is expected to be ready for training camp after offseason shoulder surgery. Davis, the Steelers’ second-round pick in 2016, became the starting strong safety in Week 11 after spending rotational time at free safety and slot cornerback early in the season. His 742 snaps last season were the second-most by a Steelers rookie in the PFF era (since 2006) behind fellow 2016 rookie Artie Burns’ 809. 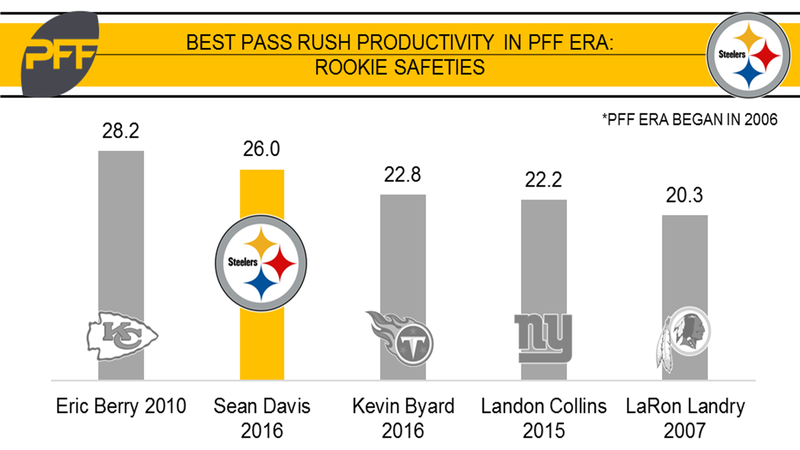 The 2016 Steelers’ rookie class of Javon Hargrave, Artie Burns, and Davis combined for the most starts by rookies on defense, with 31 combined starts. He and Morgan Burnett were tied for second-most sacks by a defensive back with three, with all of Davis’ coming after Week 11. The Steelers’ swiss army knife on defense was tied with D.J. Swearinger for the most pressures by a safety from Week 11 onward with eight.